OSE 5mm to 4mm flex coupler. The ends of this coupler are joined by a piece of .150 flex cable. 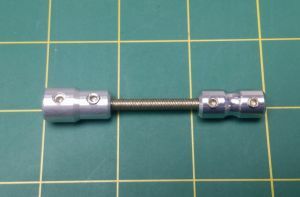 Works with motors with a 5mm shaft needed to connect to a 4mm hard propeller shaft. This allows(and requires) a slight bend in between the motor and drive shaft. Much more efficient than a universal joint. Previously made by Graupner but discontinued, we have brought this back. The flex cable is both screwed and glued for a much stronger joint than the previously Graupner made assemblies. 5mm to 4mm Coupler. Measures approx. 70mm from end to end.